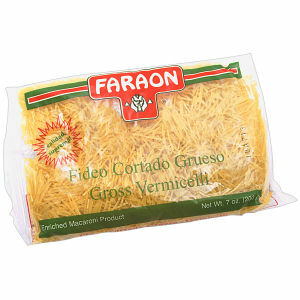 Faraon Cut Thick Vermicelli Pasta. In minutes you can have a great meal at a great value with great nutrition. Easy 7 oz package is good to go when you are ready to cook. Simply Boil Water and you are almost done! Add your favorite ingredients, cheese, meats, sauces, vegetables. You can cook Faraon pastas every day by taking advantage of all the Faraon choices. Enjoy!